For the first time in well over a fortnight, it’s raining. Naturally, I’ve taken to watching it downpour from behind a large cup of tea. I got caught out in it earlier and got soaked to the bone, so I’ve decided to do a spot of blogging before heading out to dinner this evening with my parents – they’re up from home today and I haven’t seen either of them in an age. But they can wait until the rain stops pelting against my window. I love a good storm, but not when I’m outside and literally stuck in the middle of it. June has been excellent. Summer is working out just the way I imagined it to and I’m thrilled that everyone seems to be in the same boat. We’ve had beach trips, BBQs and plenty of cake. Although my fitness levels have taken a bit of a hit (I haven’t been to the gym in well over a month) I’ve even managed to do a few races too. 1. My birthday: I love birthdays – everyone knows that. It gives me a weekend long excuse to gather all my friends in one place and eat cake. This year, given holiday plans and everyone starting in new jobs, I didn’t expect many people to come out. It was the loveliest surprise when I was proven wrong though! My friend Karen even ran around after work looking for vegan birthday cake – it was fantastic. Cornucopia does the most excellent lemon cake by the way. You know, just in case anyone is looking for some! It really made my evening. 2. Women’s Mini Marathon: Zara and I had signed up to this ages in advance but typically, after very little prep work, the day sneaked up on us. There were thousands of women in the race. We had set ourselves a time and ended up legging it across the finishing line a good 10 mins below target. BEST. FEELING. EVER. It was also great getting to have celebratory tea and cake afterwards and getting to show off our shiny new medals. We’ll definitely be signing up again next year – this time we’re going to knock another 10 mins off. Mark my words. 3. City Scavenger Hunting: Have you ever participated in a city scavenger hunt? No? You’re missing out. I’ve been lucky enough to do two now and they’ve been crazy but such craic each time. They’re known for being great team building exercises and involve teams competing against each other at finding out clues across the city centre. Bonus points are earned by completing tasks along the way (I proposed to a random man on the street. We all did handstands in suits. We went into the Disney store on Grafton St and recreated a scene from Pirates of the Caribbean.) and by learning random pirate dances and bodhran songs mid-hunt. It sounds absolutely mad, and it was, but I love all things mad. Definitely deserves its spot on my top ten for June. 4. Parks and People Watching: We’ve also been incredibly lucky with the weather over the past few weeks. I’ve been lathering on the sun cream about five times a day for the past fortnight, but nobody can say that I didn’t make the most of it. I took myself off to Stephen’s Green with some books and spent hours catching up on reading and people-watching. I also have developed a mild addiction to Calippos, but with the heat it was a given. And I’ve enjoyed every minute of it. Doing nothing in parks is one of my favourite hobbies – it got me through the college years and it’ll get me through the ever after part too. 5. Picnics: With park trips comes picnics. This one doesn’t even need explaining given that picnic photos are splashed all over the pages of this blog. But yes, I had several picnics in June and they all made me very happy indeed. 6. 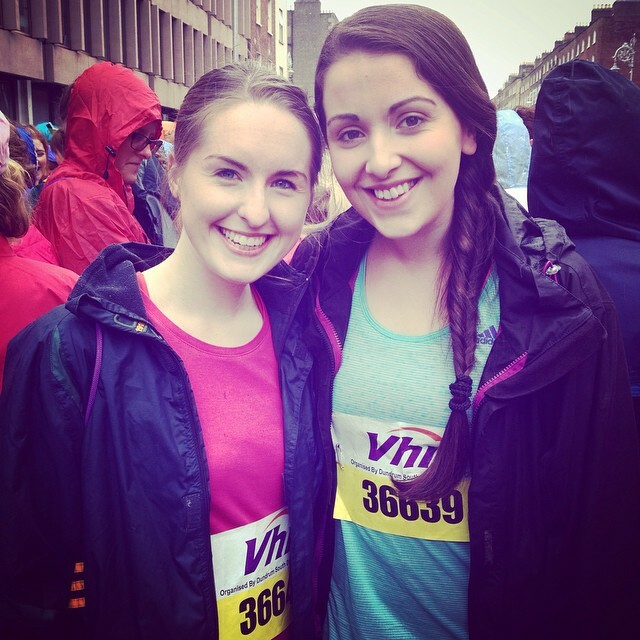 Docklands 5K: The photo above was taken right before we did the race! I noticed online that the annual Docklands 5km race was taking place mid-internship, so myself, Sean and Conor all decided to run as a little intern team. We had the matching t-shirts and planned pints on the Boat all ready. I think the best thing about races is the atmosphere – so many people cheering you on, other runners keeping you going and then the absolute delight at reaching the finishing line by beating your own personal best. It was really warm the evening we went out, but it definitely makes it on to this list regardless! 7. Adventuring in Bray: I had never been to Bray before this week. The weather was a little overcast the day we decided to venture out, but we managed to still have a picnic and make time to enjoy the exceptional view at the top of Bray Head. I’m sure the seaside walks are far nicer when the sun is out, but I think we were better off climbing up to Bray Head without the sun beaming down on us. I was wearing all black. It wouldn’t have ended well. Still, the views were exceptional. 8. Movie Nights: I’ve actually another planned with Niamh on Saturday! But yes, they’re a common feature of my top ten things that made me happy. They’re key. Before Conor headed off to New Zealand (after which he’s going to go to China, followed by starting his PhD in London) we decided to have one last movie night together. God knows when we’ll get the chance again… But anyway… we watched Grabbers. It’s a very stereotypical Irish horror film and it’s everything you’d expect it to be. And more. So much more. I think the chocolate and the company only made the film that little bit better. I’ve also been sitting down and watching a lot more Netflix. I’m not really a TV person, but now that I finally have time on my hands, I might as well see what the fuss is about. 9. Dublin Pride: Always an excellent occasion. This year, much like the last time I attended Pride, I stumbled across the parade as I was in town. The rainbows, the colours, the mood of the crowds and crowds of people in the streets – it was crazy. Wonderfully so. We grabbed burritos and watched the parade from the docks, then followed the crowd to Merrion Square. We sat out and soaked up the atmosphere there – such happy, flamboyant, incredibly dressed folk were out in their numbers. The queen herself, Panti Bliss, made an appearance. My one regret is that I didn’t manage to nab one of the giant cushions placed around the square – if I’d had one, I probably wouldn’t have left the place for the entire day. Great work Pride team, you pulled off another excellent parade! 10. BBQs: As the weather has been great, we’ve also been trying to squeeze as many BBQs as possible into the month. I’ve found it a little difficult (the whole vegan thing gets in the way) and the photo below acts as a testimony to the things vegans have to do to fit in at BBQs. I literally had to add water and mix my own burgers. Now if I’d actually thought ahead, I’d just have made some vegetable skewers or portobello mushrooms, but I didn’t, and so I was stuck with packet powder burgers. They look awful, they actually tasted great. No regrets. Ever. Anyway that’s all a nutshell of the things that I got up to with the start of the summer. I’ve been working a lot, going out a lot, enjoying the sun and catching up on adventuring and reading/watching movies. I’ve a few new recipes to try out too – they’ll be going up soon. I hope you all are having just as lovely a summer. If anyone needs numbers for a last minute BBQ, let me know. I will always be game.